Before Hasbro decided to make a number of figures painted to be on fire, Colorforms and Mel Birnkrant pioneered a concept for a space man made of flame. 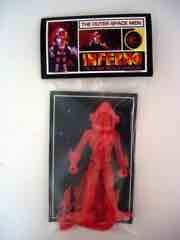 Made in a tiny run of about 300 (reportedly), the Four Horsemen Outer Space Men Alpha Phase Inferno the Flame Man of Mercury Comic-Con Exclusive Action Figure has an unreasonably long name. The very first release of this figure, this translucent red figure is really bright and one of the best figures in the line. 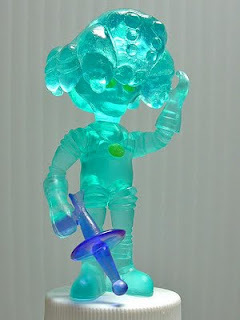 Subsequent releases were many included a fully-painted release, clear blue and clear yellow figures were also cranked out. At this time there are no known plans for additional releases of this mold, so complete collections will have four (five if you count variations) in them. Since Glyaxian Xodiac sold out (you did get your order in, didn't you?) you might need something new. Because you, like me, are impatient. To kick things off, THEGODBEAST made a special Bio-Jumper specially designed for the Alpha Phase Alpha 7 figure. (He sells the spider-like creature and others as Bio-Jumpers, read more about them here. At press time, this one can be found for sale here for a mere $15.00.) Bio-Jumpers don't plug in to the neck sockets like Glyos heads, but rather sit atop their heads sort of like a hat or a helmet. They're based on sketches from Matt Doughty, but sculpted, molded, and forged by the force of nature known as THEGODBEAST. On the October Toys forum, user Ericso posted some crab add-ons that are some of the most amazing things I've seen as add-on part. 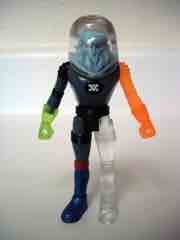 (I gotta find a way to get the crab head and claw in pretty much any color.) His customized parts are colored to match Alpha 7 as well, plus the Beta Phase Inferno figure from last year's New York Comic Con set. 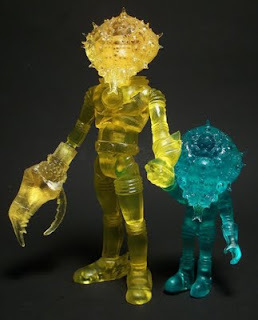 While not Outer Space Men-specific, Ericso also made this figure. It's friggin' beautiful. The crab parts were also crafted by THEGODBEAST from an actual crab part. If you're interested in these bits and pieces, you can go to his blog, read more, and contact him directly for making a purchase-- no price list on these specific items, but most of his stuff is pretty darned reasonable, especially considering the edition size. Update: Sold out! In under six hours, it no longer appears in the Onell Design store. You might have missed the update, but the pricing for the Xodiac special edition figure has also been confirmed at $12.00. You can see this on an updated post from earlier this week. This figure is going to be Friday's Figure of the Day, so be here really early Friday for a look at our review just before the order goes live. Exciting! "Thanks to a chance encounter with Pheyden long ago, Xodiac learned of the Glyos System and how to travel through the Edge of Space to get there... " Go to Onell Design and read this post for the rest of it. "Special Note - The Glyaxia Xodiac is a triple crossover with the combined forces of Mel Birnkrant and the Four Horsemen. This version of Xodiac is the guest 'Traveler' for this wave, helping to train the Glyans to be better soldiers and maybe teach them some Space History 101 from the Milky Way. HUGE thanks to Mel and the 4H for letting us play around with one of their creations, it is truly a dream come true! I am personally crazy about how this figure came out, a true testament to the craftsmanship that those guys put into everything they do." You can (and should) read more at the Onell Design Blog update on this new collection of toys. There's going to be a Rig figure which matches Xodiac, complete with large tampo designs on the wings, for $25.00. It looks good! 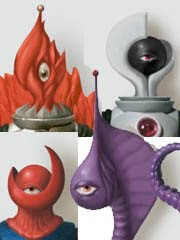 The Crayboth are particularly neat-- they feel sort of like Battle Beasts, and yet somehow also seem right at home with the Outer Space Men. A 2-pack is about $6.00, so really, you'd be foolish to not buy them. (Heck, I regret missing the glow-in-the-dark ones.) They're scheduled to appear in an upcoming Figure of the Day at 16bit.com. You can swap parts between these figures and your Outer Space Men, plus they're fun. If you're ordering on Friday anyway, it's not like you can avoid paying shipping, so throw some more toys in the box. Word is getting out-- the Glyaxian Xodiac is approaching! I got a sample a few weeks ago (you may have seen him sprinkled in some pictures) and this thread on the Fantastic Exclusive Forums shows others have too! It's a fully-painted figure with clear ABS plastic accessories, so you can have clear gear on a clear Xodiac if you're so inclined. I'm waiting for a few details on the "production" piece before posting the review but it'll be up very soon. I was told this should be included in the next Onell drop, so keep an eye out! Here's something neat-- an Outer Space Men TV spot from the 1960s! It focuses on the first batch of characters-- the ones that actually made it out-- from Colorforms. An amazing talent (and book cover illustrator) named Bruce Jensen has posted Outer Space Men custom head drawings so good, you'd swear they were real plastic. Or at least, I would. A post on his own blog highlights his latest entry, a modified crescent-inspired cyclops for the Xodiac body plus three other really nifty original designs for use on the painted bodies. At this time there are no known plans to produce these, as they are not real three-dimensional things. You might also want to check out his alien paintings and other stuff, unrelated to the brand, but cool stuff all the same. Hey Bruce: if you're reading I'd buy some figures. Just saying that if you put up a massive investment of tens of thousands of dollars to make these happen, I WILL buy a set. That's literally tens of dollars, right in your pocket. "OSM waves 3 & 4 Alpha Phase waves FINAL 13 SETS up for sale tomorrow (Wed.) night at 9pm at StoreHorsemen.biz !! -FH-"
So there you have it-- just 13 sets remain! They're really good figures, so if you're on the fence just buy them. Watch this page for ordering information. I like my set, so unless you plan to hold off for the painted editions, just get them.